Earth Day is a global event of action and participation for the planet. This year’s theme ‘Protect Our Species’ aims to draw attention to declining, endangered and threatened species. 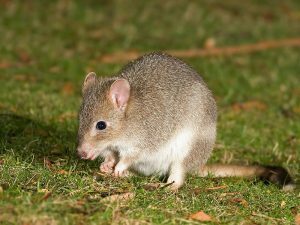 Tasmania is the last refuge for some of Australia’s most critically endangered animals – species that are now virtually extinct elsewhere, including the Eastern Bettong, Eastern QuolI and Eastern Barred Bandicoot. Together with local farmers, the Tasmania Island Ark program is recreating over 6,000 ha of wildlife habitat across Tasmania. Read on to find out about 13 threatened species we aim to protect through our restoration projects. Your donations will help to create a stronghold for endangered wildlife and reconnect people with nature, while revitalising local farming communities. 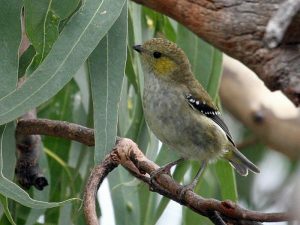 One of the smallest birds in Australia, the endemic Forty Spotted Pardalote belongs to a group known as ‘diamond birds’ due to their tiny, jewel-like appearance. 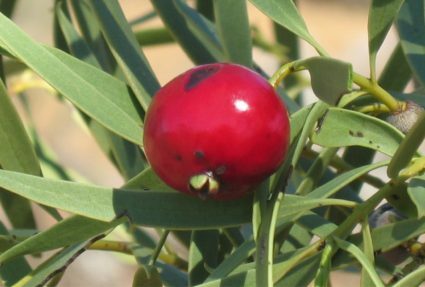 They live in dry eucalypt forests and woodlands only where white gum occurs. 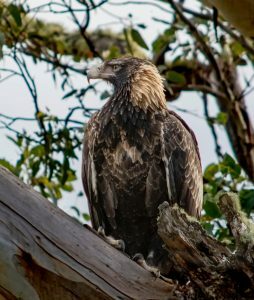 In direct contrast with the tiny pardalotes, the Tasmanian Wedge Tailed Eagle is Australia’s largest bird of prey. It occurs only in Tasmania. We’re addressing threats such as loss of nesting habitat, as it’s estimated that fewer than 1,000 of these birds remain. These critically endangered birds are notoriously hard to spot due to their brown plumage. Native to King Island in the Bass Strait, these rare birds are only 11-12cm long, and reside in dense, swamp forests. Swift Parrots are what we’d call ‘breeding endemics’, meaning that while they spend winter on the mainland throughout Victoria and NSW, they travel back to Tasmania to breed. 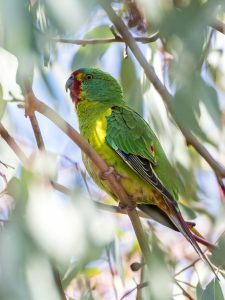 Due to the clearing of their blue gum habitat in Tasmania, the Swift Parrot is in decline. 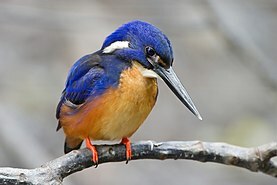 This spectacular, bright blue subspecies of kingfisher occurs only in Tasmania. It spends its time in the shady vegetation overhanging major rivers, feeding on small fish, crayfish, aquatic insects and occasionally frogs. It is thought that fewer than 250 mature individuals remain. We can protect them by maintaining their habitat and riverside vegetation. You will most likely hear the Australasian Bittern before you see it. Its distinctive booming call will give it away, while its brown colour camouflages it within bushes – on occasion it will even sway in time with the reeds to blend in with its surroundings! 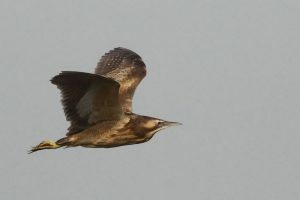 The Australasian Bittern is on the Australian Government’s priority list of 20 threatened bird species. This nocturnal marsupial is now considered extinct on mainland Australia due to introduced predators such as foxes and cats. Sadly, their population is now in decline in Tasmania too. 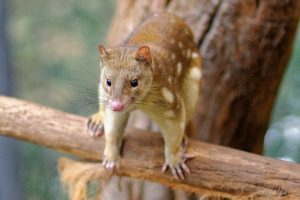 The Eastern Quoll is a key species due to its important role as an ecosystem engineer, scavenging on carrion on the forest floor. They are also a natural predator, maintaining balance in the bush. The Spotted-tail Quoll is the second largest of the world’s surviving carnivorous marsupials. Some are large enough to compete directly with Tasmanian Devils for food. One of the main threats it faces is the loss and fragmentation of its habitat, especially areas of suitable forest with sufficient numbers of den sites and prey. Like the Eastern Quoll, introduction of predators has had an effect on its population. Best described as a ‘tiny kangaroo’, the Eastern Bettong is found in Tasmania and now also in the ACT since it has been reintroduced. 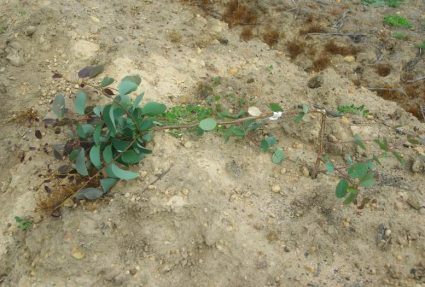 Comprehensive reintroduction to the mainland can help fulfil an important ecosystem function—Eastern Bettongs’ scratching and foraging improves water retention in the soil and increases composting, providing crucial support to the threatened box gum woodlands that it resides in. 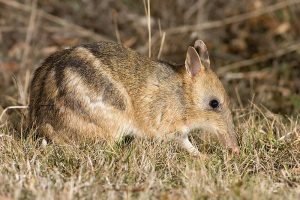 The Eastern Barred Bandicoot has one of the highest breeding rates of any animal of their size. Their gestation period (the time from conception to birth) is one of the shortest recorded for any mammal — 12 days! Which makes it surprising that this species is at risk of becoming extinct, despite being a common fixture in Tasmania. 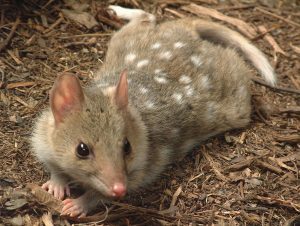 Large-scale land clearing and the introduction of foxes led to their extinction on mainland Australia; unless we recreate new habitat and manage feral cats in Tasmania then the Eastern Barred Bandicoot may very well become extinct. Despite the name, its colouration varies considerably, but all adults have a pale green stripe down the middle of their back and turquoise thighs. This is the only Tasmanian frog which is seen ‘basking’ out of the water (frogs bask in the sun to absorb solar energy and raise their body temperature.) 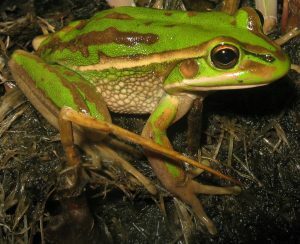 The main threats to the Green and Gold Frog are clearing and draining of wetland and lagoon habitat. 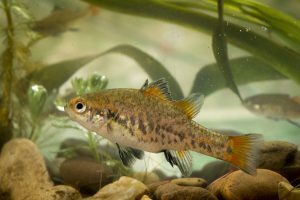 A small freshwater fish, the Tasmanian or Southern Pygmy Perch grows to a maximum length of 85mm. Usually cream, or gold-orange, during breeding season the males’ fins become a stunning red colour. Predation by alien species is thought to have played a role in the decline of this species. Habitat alteration is also likely to be involved. This is the largest freshwater crayfish in the world, found only in rivers of North Tasmania. The species is very slow growing, slow to colonise new areas, has low breeding potential, and is easily caught. These characteristics, combined with many years of overfishing and loss of habitat, have led to a significant decline in this species. The Giant Freshwater Crayfish faces continuing threats from illegal fishing and loss of healthy stream habitat. 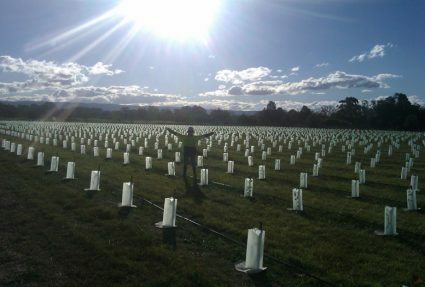 Through our Tasmania Island Ark program, we focus on restoring, enlarging and connecting patches of habitat in the landscape for Tassie wildlife. We aim to restore 15,000 hectares of habitat across Tasmania by 2030. Your donation will help us reach this goal.